Researchers have found that meat and poultry sold in the U.S. is contaminated on a large scale by drug-resistant Staphylococcus aureus. This bacteria can cause not only mild to serious skin infections (boils, abscesses), but even deadly illnesses such as pneumonia, infection of the blood, or sepsis, infection of the bone (osteomyelitis), heart failure through infection of the heart valves (endocarditis), inflammation of brain and spinal cord (meningitis), as well as toxic shock syndrome. Side Effects of Garlic: Not TOO Much, please! HIV and Garlic: Dramatic Results! 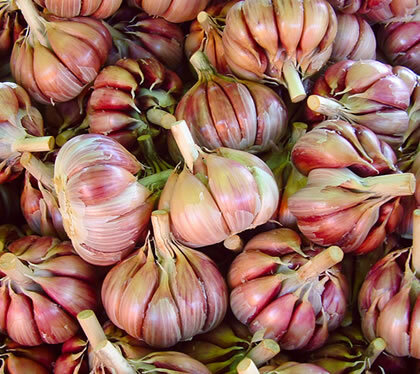 Itchy, Sore Throat – Gone with Garlic! The Common Cold: Beat the Post-holiday Drip! What else: GARLIC ICE CREAM! The information contained in these articles and the publication thereof do not constitute practice of medicine nor are they intended as medical advice. They do not replace the advice of your physician. All materials on this site are solely given as informational reading. Neither the authors or publishers take responsibility for any possible consequences of any procedures, treatments or dietary changes or applications as a result of any of the information provided. Before undertaking any course of treatment, the reader should consult their doctor or other health care provider.